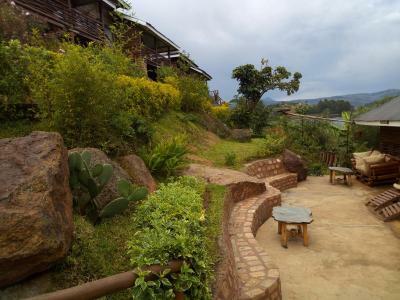 Lock in a great price for Lake Bunyonyi Rock Resort - rated 9.1 by recent guests. The staff were super attentive and welcoming we felt very comfortable and looked after. The location and services were great. The only good thing about this hotel are the location (nice views) and the facilities (big rooms with reasonably nice furniture). Breakfast was pretty decent too. Stayed here as a family of four for three days : so beautiful and relaxing , amazing views and great food ! The staff are incredibly attentive and helpful with everything, from arranging transport to advising on day trips. Thanks to Pius who was fantastic. The kingfisher rooms are pricier but huge and gorgeous ; the big bed could easily sleep 3-4 people . The smaller budget rooms are much more modest and cell-like : a bit like a youth hostel room but clean and adequate. We were upgraded on our last night so we both had kingfisher suites with stunning views of the lake.! Despite the negative start to our stay the staff really did their best to accommodate us and this review is thus not at all directed at them. The view from the hotel is nice and the food is quite decent. Little extras like a fire when it gets cold do help. The WiFi is slightly erratic and only reaches certain parts of the venue. Staff was friendly and kind, breakfast was amazing! Perfect location with a stunning view! Wish we could have stayed longer than 2 nights!!! The location is pretty far down a bumpy road, but it is absolutely stunning and well worth the ride. We spent hours watching the birds and otters on the lake. The "moderate" room is huge and luxurious. 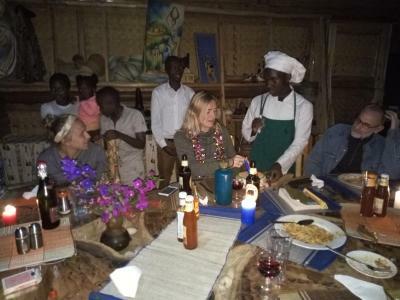 Jessica was very helpful in helping us book permits and transport for gorilla trekking at the lowest rates I could find on the web. The staff in general was super friendly and personal, and the food was excellent. Staff and views were amazing. Would highly recommend a visit to there. 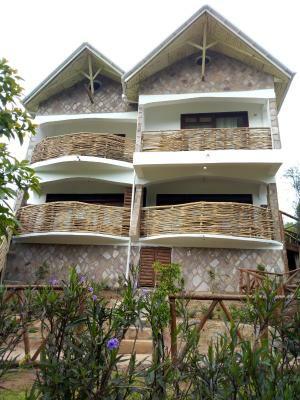 The resort is very nicely situated further down the road than other places. We were received in a very friendly way by the great staff of the place. There are very nice communal areas and restaurant. We liked the food and the atmosphere. We booked the budget room-my mistake, which was really nothing special but even in this newer building there are some communal areas and balcony with lake view. The night was very quiet and breakfast was good. The staff and service were exceptional. Pious went out if his way to ensure we were all comfortable. Had booked budget rooms but were upgraded for a minimal fee. Totally worth it! The views were breathtaking. The food was also great especially the Pork joint for 2. My colleagues had the meal 2 nights in a row! The hotel is also more beautiful than portrayed on booking.com. 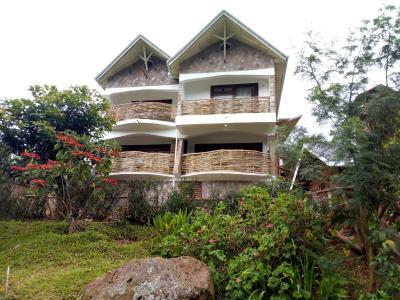 Would definitely recommend it for a weekend getaway from noisy Kampala. One of our bestsellers in Kabale! 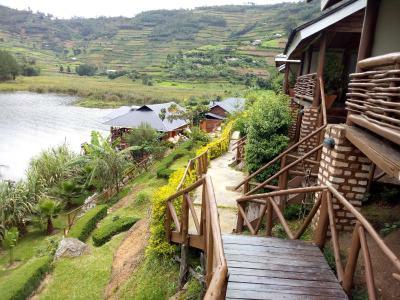 Lake Bunyonyi Rock Resort, a resort, is a property situated in Kabale. This resort offers a private beach area and free WiFi. 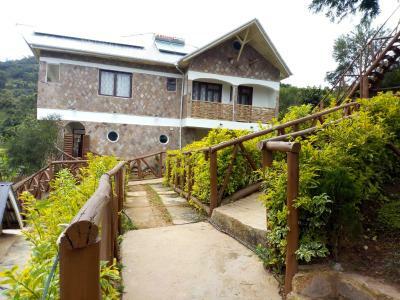 The property provides mountain views and a barbecue. 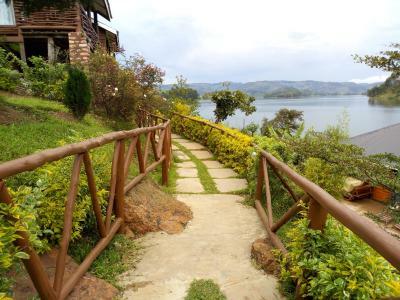 Certain rooms at the resort rooms have a terrace with a private bathroom equipped with a bath or shower and free toiletries, some rooms at Lake Bunyonyi Rock Resort also provide guests with a lake view. The units will provide guests with a desk and a kettle. Breakfast is available every morning, and includes Full English/Irish and continental options. The accommodation offers a terrace. The area is popular for cycling, and free use of bicycles is available at this resort. Bushara Boat Launch is 1.9 miles from Lake Bunyonyi Rock Resort, while Royal Supermarket is 3.7 miles from the property. 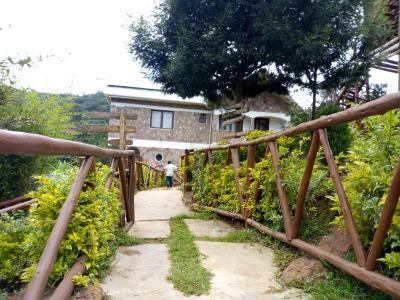 Lake Bunyonyi Rock Resort has been welcoming Booking.com guests since 24 Oct 2016. 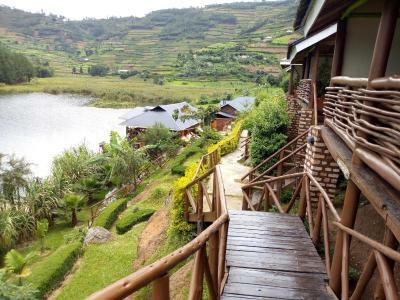 When would you like to stay at Lake Bunyonyi Rock Resort? 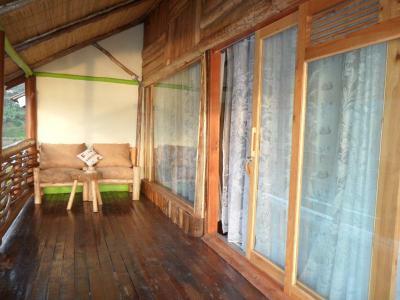 This double room has a balcony, toaster and minibar. 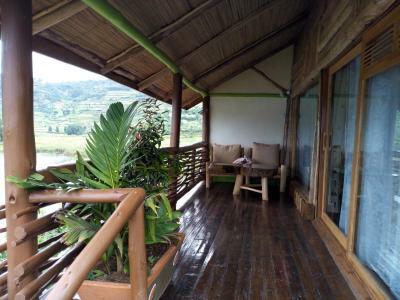 This suite has a balcony, private entrance and barbecue. 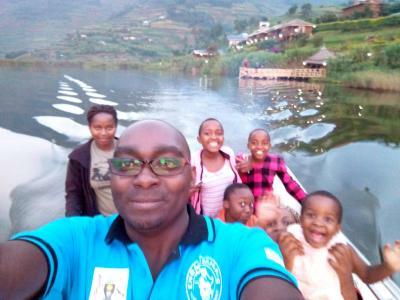 House rules Lake Bunyonyi Rock Resort takes special requests - add in the next step! 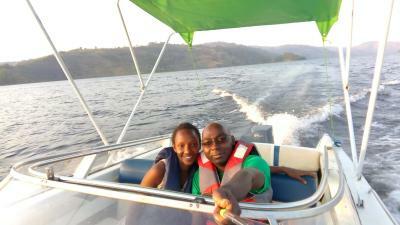 Lake Bunyonyi Rock Resort accepts these cards and reserves the right to temporarily hold an amount prior to arrival. 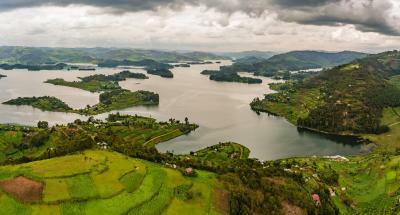 Please inform Lake Bunyonyi Rock Resort in advance of your expected arrival time. You can use the Special Requests box when booking, or contact the property directly with the contact details provided in your confirmation. we paid for the most expensive room. however, there was no hot water in the shower. they tried to fix it but then there was no sufficient water pressure and they weren't able to repair it. in addition, despite them indicating that they had Wi-Fi it did not work well at all. Robert, the owner, said he can't do anything about the internet. 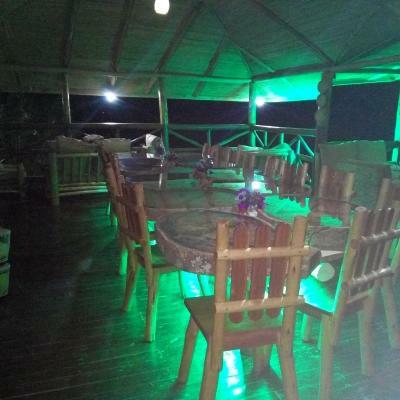 he gave us 20 USD per night discount but we still felt that the price was too high given these issues. staff were extra helpful, very friendly (thanks especially to Anita;) and accommodating. the place is absolutely gorgeous! Booking.com was horrible to deal with. I would advise to book directly with the hotel, the staff are very helpfful and take lots of initiative and are super flexible. We had to cancel one of our nights before we got there due to change in schedule. Booking.com never replied even though they tell us they get back to all queries within 48hours, we spent the last morning of our meant to be relaxing holiday on hold until booking.com answered and it seemed like they just never bothered to look at our request, they kept going around in circles saying they need to confirm from the hotel etc. And wasted our morning basically. Unhelpful and to this day still hasn’t contacted the hotel to confirm a free cancellation like they should have. I also used the pop up chat to ask whether a triple room was the only option (there were only 2 of us) and whether it was full board. They said yes of course. When we got there the hotel manager told us there were plenty of double rooms available which would have been cheaper and that the booking was only for bed and breakfast. Pretty unacceptable of booking.com - book directly with hotels, don’t even bother with a third party that’s so bad. From start to finish our visit was a catalogue of failings without a single apology from the staff. We arrived tired after a long drive at 7pm and after greeting were abandoned in the bar without being checked in. After ten minutes a drink finally appeared and we asked if we could go to our room. This seemed to completely throw the staff who then never gave us any of the normal check in information (wifi, meal times etc.). 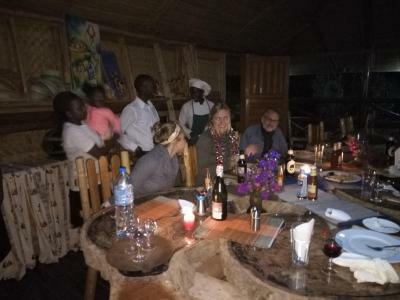 The staff member, Pious, eventually remembered to get us a menu to pre-order dinner and then announced food wouldn't be ready until 90 minutes later (by this point, 9.30pm) as there was a 'big group' ahead of us - this 'big group' turned out to be five people. The water pressure in the shower was terrible and hot water took over five minutes to come. Then we were woken up at FOUR FORTY FIVE AM because they mixed up the rooms for wake up calls! The worst part of this was there was no apology at the time or afterwards - the same woman who woke us up in the middle of the night actually asked us if we had slept well!!!!! With no sense of irony! By this point we had asked to see the manager three times - the staff kept saying yes but never brought her to us. When we finally found her (Jessica) she was completely unapologetic about the wake up call and dinner situation, so we decided to check out early (we have traveled a lot and never done this before). Even at that point, no apology was offered and her main concern was not having to pay commission for the extra night on booking.com! We thought by now our Fawlty-Towers experience might be over, but no, it was just getting started! Next, on check out, they announced that the price of beer in the menus was wrong (7,000 rather than the 5,000 USh shown). And when we asked if the resort's driver could take us to the border, the manager refused saying he was busy checking other guests in (no other guests arrived in the entire time between asking this at 10am and us leaving at 12pm). Nothing really: hot water a bit erratic . First of all the location of the hotel is not correct on google maps and it’s a much longer drive from the main road than you’d expect. Unfortunately we had a negative start to our stay. Despite our booking confirmation clearly indicating we would have a room with its own toilet and bathroom (in the room specs), we were put in rooms that had nothing but a bed inside it. On arrival we were told we could pay to be upgraded to a better room, after which we double-checked the confirmation and showed it to staff. The staff had to consult the owner through phone who eventually came on the phone with us herself and rudely said we “probably didn’t read carefully when booking”, despite us having the booking in front of us and having shown it to her staff. We offered a compromise proposal to pay a little extra (but not the full amount demanded) to come to a settlement but were told we could just cancel if we wanted. As it was getting late and we didn’t want to take the long road back we decided to take the room as is but indicated we would write a negative review, which the owner didn’t seem to care much about. Hereby. Water pressure needs to be stronger. WIFI is hit and miss. Very out of the way and hard to get to, so very peaceful and quiet. The friendliest staff on Earth. Plenty of relaxing walks and boat rides. The food that we had was really tasty, but some items that we wanted to try on the menu weren't available. The budget rooms were also extremely tiny. 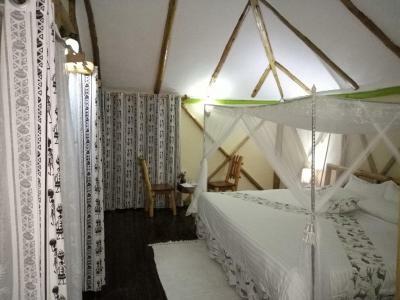 The reason for not getting an even higher rating is basically the room which was fine but somehow not adequate for the beauty of the place and the hotel. If you book budget, you get budget also in terms of size. 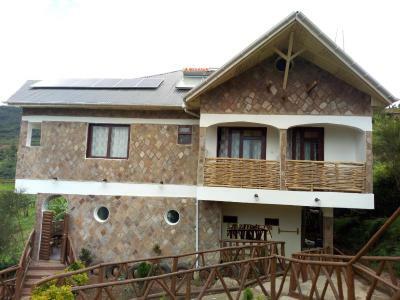 When you don’t expect too much and don’t plan to spend to much time in your room, then you will love he rock resort!